As expected, Escondido assistant city manager Graham Mitchell was elevated in rank Wednesday, following last week’s resignation of long-time city manager Clay Phillips. Phillips, 58, suddenly announced his retirement last week, effective Dec. 18. His $200,000-plus city pension begins at age 60. Mitchell, 46, was hired this summer as assistant city manager following the retirement of another longtime official, assistant city manager Charles Grimm. Mitchell had been city manager of Lemon Grove, population 25,000, since 2003. The announcement was made at the regular Escondido City Council meeting. Mayor Sam Abed praised Mitchell, an unanimous choice, as a guy with integrity and skills. He said Mitchell and family would relocate to Escondido. Mitchell had made in excess of $180,000 as Lemon Grove manager and $203,000 as assistant Escondido manager, a city six times larger than Lemon Grove. Mitchell was expected finalize his contract on Nov. 18, a time at which his salary and compensation package would be revealed, city officials said. Praise from the high dais was effusive. Abed said he was very proud Mitchell had joined the team, adding the city was in good hands. City Attorney Jef Epp said the appointment was exciting, adding that the smooth transition would be good. Mitchell came prepared releasing this statement after the council meeting. “I am grateful to the Escondido City Council for the opportunity to serve as its city manager,” Mitchell said. “Over the past few months I have thoroughly enjoyed getting to know the community and meeting Escondido residents and business operators. I am impressed with the vision the City Council has established and the staff I have the privilege to work with,” Mitchell said. 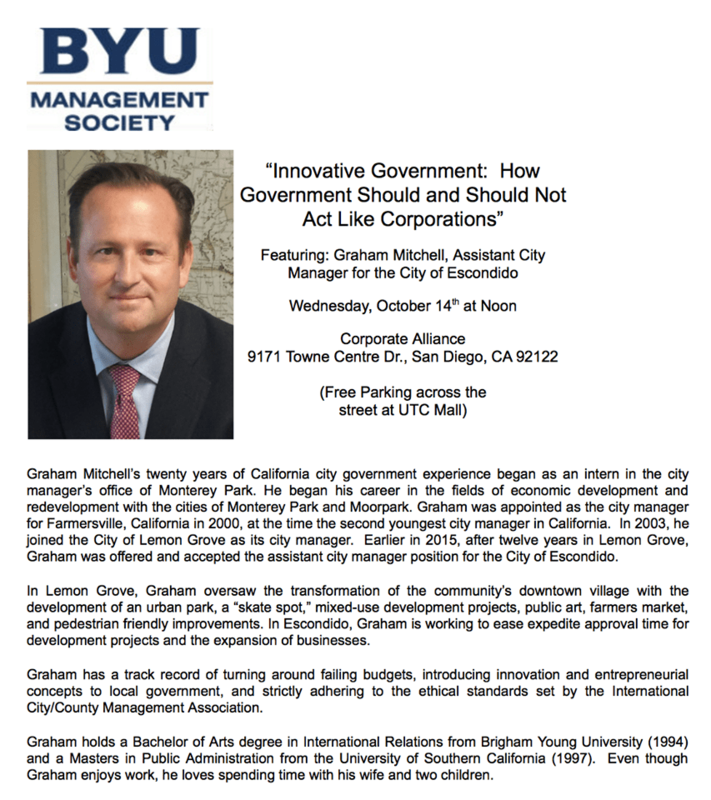 Mitchell’s background included a bachelors degree in international relations from Brigham Young University and a master’s in public administration from the University of Southern California. Born in Virginia, he was city manager of Farmerville, near Visalia, a city of 10,000 people for three years before coming to Lemon Grove. As for Phillips, An annual 12 percent pay raise in his 2013 contract made Phillips the highest paid city manager in San Diego county. His $234,719 in base pay in 2013 beat out city managers in Poway, Chula Vista and Oceanside, who each made $220,000 to $230,000 that year. Base pay didn’t even tell the entire story. As city manager, Phillips also received a $9,000 annual car allowances the ability to convert half of his nearly 10 weeks of annual vacation days to cash and eligibility for a city-funded pension to begin at age 60, paying him more than $200,000 annually. Phillips said he would spend more time with his family after leaving city office along with time devoted to a vineyard owned by him and his wife at Valley Center.